The Smith Memorial Congregational Church, which was erected as a tribute to the memory of missionary Rev John Smith who was sentenced to die by hanging for the role he reportedly played in the East Coast Demerara slave rebellion in 1823, celebrates its 173rd anniversary this month. According to a release from the church, Rev Smith, a London Missionary Society (LMS) minister, died while a prisoner on death row on February 6, 1824 and was subsequently referred to as the ‘Demerara martyr’ as a result of the circumstances surrounding his death. 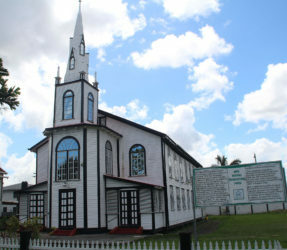 He arrived in Demerara in February 1817 to succeed the Rev John Wray, pioneer missionary of the LMS and like his predecessor he gave instructions to the slaves. They taught them to read the bible and catechism and did much to lay the foundation of schooling and education for their congregations. The leader of that 1823 rebellion, Quamina, was a senior deacon at the Bethel Chapel then located at Le Ressouvenir and his son Jack Gladstone and other slaves suffered death for the roles allegedly played by them during the uprising which organisers had hoped would have freed the slaves. It was on November 24, 1843, 20 years after the date Rev Smith was sentenced to death, the Smith Memorial Chapel was opened on Brickdam as a tribute to the work and suffering he had endured on behalf of his deacons, members and followers. The site on which the building is located is now regarded as a heritage site.